"This is a recipe I've had for years. It's great served warm, but cooled to room temperature is good, too. Keep leftovers in the fridge, if you have any." Preheat oven to 350 degrees F (175 degrees C). In a large bowl, mix flour, 1 tablespoon sugar and baking powder in a bowl. Cut in butter until mixture looks like coarse crumbs. Stir in 2 tablespoons whipping cream and 1 egg. 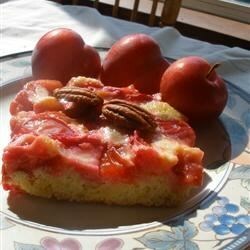 Press in bottom of ungreased 9-inch square pan and arrange plums over the top. Bake in the preheated oven for 25 to 30 minutes. While cake is baking, in a bowl, combine 1/2 cup whipping cream, 1/2 cup sugar, 1 teaspoon vanilla and 1 egg. Beat well, and pour mixture over plums and bake an additional 20 to 30 minutes or until custard is set. Serve warm or cool. Store in refrigerator. IF I make this again I would double the custard. A delicious kuchen if you prefer custard desserts, I thought it was better than the gourmet recipes. Loved it! I halved the recipe and baked in a loaf pan, next time will follow other users advice and double the custard mix. Loved it! I increased the amount of custard, as recommended by another reviewer, and it was delicious!